Hello April. The beauty of Spring season and all around happiness made us so energized to start our exciting plan 2019. Time is flying too fast here since we are having the last moments of Spring season. Today, we would like to have updates but not about what we have been doing. We are going to discover new phpFox apps and themes in the first quarter of 2019. Let's sit down, enjoy a cup of coffee and start our journey now! New phpFox Apps and Themes Upgrade Member Level [V4] by YouNetCoImagine that when your community has several user groups such as experts, staffs, service providers, etc. or just normal users. Newly registered users (or current users) may expect to become members of these user groups. You surely don’t want them to go over complicated steps to get their upgrade level requests to be noticed and approved. Upgrade Member Level app will be the best solution to solve this problem. Read more Social Connect by FoxExpertSocial Connect allows users to make a connection between your website account and user existing Social IDs. This will increase user traffic and will benefit your website in terms of popularity. Read more Gamification [V4] by YouNetCoGamification, or community rewards, is the program to reward prizes to most loyal and contributive users on your community based on their activities in the form of a game-like element. The app encourages users to join your community and engage in pre-defined actions to earn points. Read more Shopee template by suresh choudharyShopee template is a high-quality E-commerce social networking theme with unique style and clean code. Shopee is the best suited for social websites, design with the sliding main menu and unique home page. Shopee template has a creative, impressive, totally different design with many specific sections in one page. And basically used for online store displaying on the Home page. Read more Social Login by FoxExpertSocial Login app increases user registrations on your website by allowing users to log on your website using their existing social media credentials and pre-verified accounts. This phpFox app provides single sign-on from existing social networking services and simplifies registrations and logins for your users. Read more Voice Messages by FoxerGiven that voice messaging is a thing on nearly every other apps / social networks, this has been a long time coming for phpFox! With Voice Messages app users can send and receive voice messages from their friends directly on your phpFox website. Read more Flying Hearts by FoxerWhen the app is installed, the front end of your phpFox social network will have floating hearts to help spread the love! Read more Ask Me Anything [V4] by YouNetCoEveryone is familiar with Ask Me Anything feature of Reddit, one of the most popular online communities over the world. We see that this feature is very essential for any social network site. Learning from others' experience is always a great way to obtain useful and interesting information and lessons. So we bring this feature to phpFox sites with AMA (Ask Me Anything) app. Read more Import Contacts by FoxExpertIt is a new level of Inviter plugin with powerful tools for your members to import contacts and find friends. This plugin provides not only contacts importing tools, but also allows members to get connected with their Facebook, Gmail and WindowsLive (Hotmail) connections which are already signed up on your site and invite whose are not registered yet, and many other features. Read more Music Embed Support by AR CompwareThe app allows users to directly share their favorite music songs from SoundCloud, Spotify, and Pony.fm and have them directly embedded in feed posts. Simply add the link into the post, post it, then the embed will be available. Additionally, embedded songs can be viewed directly on the feed rather than a popup! Read more Social Chat by FoxExpertIntroduce Live chat for a whole new level of interactivity. Real-time conversations can happen privately between members. Connecting with Phpfox Messages system, allow to have a quick way to chat and use the history of messaging. Online members receive audio and visual notifications for incoming chat messages. Read more Contest by FoxExpertContests app is a very powerful and robust app that enables you to run and manage contests and competitions on your website. This app provides you full control over the contests on your website by providing many features, settings, and options with optimized performance and easy interface. Read more Dark Mode by FoxerWith Dark Mode app you can enable your users to switch Material Template's color scheme between Dark Mode and normal style smoothly to improve the readability of text, images, and videos. Reading website content at night time can be difficult. Help your visitors read more content, spend more time on your social network and protect their eyes from being hurt. Read more Comment Image Advanced by Scheinwelt-MediaWith this app, you are able to allow specific user groups to upload images or share image URLs within their comments. The app is a more advanced version of my better comment image app with image preview, cache system and new methods of uploading and displaying the image files. Read more Coyonet Dark by Scheinwelt-MediaThis is a dark version of the Coyonet theme. It is a very clean look theme and the full width of the site gives more room to display the users content. A fully responsive and modern looking theme for all site owners that want something different. If you are looking for a more colorful theme please check out Coyonet classic. Read more Multiple new Language packs by Simplify Social Network That's all. We hope that you are interested in these new phpFox Apps and Themes.If you are having any inquiries about these products, please don't hesitate to contact the product vendors to get exact answers. New to phpFox? We are proud to provide the completed solution to create your high-performance social network. So you can build your social network with a web version as well as mobile apps (iOS and Android). The setup is easy and quick.Don't forget to subscribe to our newsletter to receive the latest news and deals in upcoming events. Yes, it’s officially the holiday season! You can feel the festive spirit is all over the place. Let decorate your house and your tree to celebrate this wonderful time of the year. Don't forget to take a look at new phpFox apps and themes in November, and gear up your Social Network with the best products. 1. Redirect after Logout by wlookThis simple app helps Admins to choose a specific page to redirect their users after they have logged out. You can use the default page by keeping goodbye in the field. The app support SSL and non-SSL domain or page to redirect. Learn More... 2. Admin Create Users by wlookThe app is a powerful administrative tool which allows Admins to easily create users on the fly right from AdminCP.When adding a new user, Admins has 3 basic fields needed to add a user: Display Name, Email, Password. You can leave the password field blank to generate a temporary password or enter one for your user. Additionally, you can force to change the password on the first login or disable changing password.Learn More... 3. No Password Login by wlookAnother great choice when you want to demonstrate your community. No Password Login app allows users to login without a password. Basically, whenever users want to sign in, the system will send them a one-time link via email. With this URL, users can sign in without asking for a password.Learn More... 4. Graffiti by FoxerDrawings are often used when users have a special event, want to congratulate someone, make a compliment or simply talk with each other. Graffiti app adds the ability to create graphical messages posted into activity feed that can be drawn by hand using multiple instruments. The specialty is in another kind of presentation – Members can see not only text but a bright picture that attracts more attention.Learn More... 5. Business Map by Scheinwelt-MediaWith this app, your site works as a business directory. Businesses are showing up on a map and can be filtered by categories. Users can also search businesses by country, city, street, name, and words within the description.Learn More... 6. Photo Popup Viewer by FoxExpertPeople using Facebook love their photo popup viewer with many options, this is a similar solution for phpFox. The app provides users the ability to browse photos using popup photo viewer. Also, this app allows easy AJAX editing photo, tag people and other different options like rotating, featuring and sponsorship...Learn More... 7. Contact us Access, Stop spam to contact us form by wlookThe app stops spammers from spamming your mailbox via Contact Us form on your site. Simply just select a User group to Turn On/Off the access to the form for that group. to your contact us form.Learn More... 8. Site Review by Scheinwelt-MediaRatings are very important to let potential users decide if it is worth their time to signup for your social network. With this app users can rate your social network site. The latest ratings show up in a block with a link to all the ratings.Learn More... 9. Auction by FoxExpertThis module was created to give merchants the ability to sell products on auctions in easiest possible way. Auctions are a great way to attract and keep customers in your social network. You will be sure that customers are paying the right price for your products. You don't have to negotiate prices with customers anymore. Managing auctions is very intuitive, and fully integrated with your Phpfox.Learn More... That's all for now. If you want to learn more about the functions and features of these new products, you can contact directly to our third-party vendors for inquiries. Or you can let us know your thoughts on these products by writing to hello@phpfox.com or create tickets in Client Area. Also, in case you want to customize these apps to your own needs, you can ask our Experts to assist you on your tasks.Wanna purchase new licenses? As you may know, the very new version 4.7.1 was just officially released. We have been receiving much positive feedback about this release. You can purchase phpFox right now to enjoy these above perks just by clicking on the button below. That's it for a pleasant November.Remember to subscribe to our newsletter to receive the latest news and deals on upcoming Christmas and New Year promotion from phpFox. We all know you are busy with all the works and plans as only two months away to say Goodbye to 2018.However, November still comes upon us with a festive spirit. Are you ready for the Holiday season?Let's stock up and be prepared for the coming pleasure time, but don't forget to take a look at what's new in phpFox Store with New Apps and Themes in October 2018. 1. Content Visitors by cespiritual This simple app displays a block to show the last visitors of 8 popular modules of your Social Network: Blog, Music, Listing, Photo, Video, Event, Quiz, Poll. It will also show the time of each visit. Learn More... 2. Donate/Fundraising App Visitors by FoxExpertGot a business idea? Great! Now, thinking about its funding. With a huge number of user-friendly features and customizations, this app is everything your users could want from Crowdfunding and Donations on your social network. Also, this plugin very suitably if you just want to add a donation for your website, describe your needed and put it as Site campaign. Learn More... 3. Easy Slider Block by FoxerThe app offers an easy-to-use slider that can be set up from AdminCP using drag-n-drop. Block displays on Member's Home Page by default. Learn More... 4. Rewrite Rules by FoxExpertURL of your internal pages is very important to users interface and more important for search engines, so you need carefully manage each URL, which explains the best section where the user in. FoxExpert offers this app for these requirements, so you may use it along with FoxExpert's Advanced apps or Core apps. Spent 2 minutes and have better URLs for all your modules. Learn More... 5. Wasabi CDN by Scheinwelt-MediaWith this app, your site is able to store and retrieve content through wasabi CDN. Wasabi uses Amazon S3 technology but is much cheaper and faster than Amazon. Give your user only the best experience using your Social network by providing fast page display and huge storage plans. You can even monetize that storage. Learn More... 6. Subscriptions Comparement by FoxerSubscriptions Comparement is accessible for any phpFox license type and allows you to earn money from your users by offering them subscription packages compared with your specific features. With Subscriptions Comparement you will get a better option of presenting your packages in an advanced way. Learn More... 7. Message by phpFoxSending and receiving messages among users are MUST-HAVE activities in any Social Network. And surely Message app will quench the thirst of phpFox users for a modern and full-featured Messaging app. By analyzing user experience and applying to app layout design, users now can send, receive, view, compose and reply messages in the most convenient way with Message app. Additionally, many user-oriented features such as Custom List and Conversation Management definitely will level up the user experience and speed up messaging tasks for users. Learn More... 8. Activity Point by phpFoxActivity Point is one of the gamification tools on your social network to encourage members to have more interaction in the community. With this app, you reward members by giving "virtual points" for each of their activities. Activity Point app also enables developers to take advantage on pointing system and use it to develop many features which related to Activity Point. Learn More... 9. Maxfoxer Template by suresh choudhary MaxFoxer comes packed with all module design and the best features for you to customize it the way to need. The theme is high-quality with a unique style and clean code. Using modern designs and subtle animation effects, animation banner. Additionally, the template opts to a fully responsive design with the color theme, layouts, images, buttons, and menus were completely re-designed. The template is designed for people to share their music, profile, pages, groups, menus, members page, and video. Learn More... 10. Coyonet Template by Scheinwelt-MediaCoyonet template is for everyone who wants a modern and simple theme with a side menu that looks just different than all the others. Try something new and show your users that the Social Network is just starting a new trend. Learn More... 11. ThemeX Template by Codemake SoftwareThemeX gives you the best sense of everything you want to accomplish. It is a banging phpFox template for social network sites. ThemeX uses all the latest web trends and technologies, like HTML5, CSS3, and Bootstrap for a stable and responsive experience. Learn More... That's all for now. If you want to learn more about the functions and features of these new products, you can contact directly to our third-party vendors for inquiries. Or you can let us know your thoughts on these products by writing to hello@phpfox.com Also, in case you want to customize these apps to your own needs, you can ask our Experts to assist you on your tasks. That's it for a busy October, and don't forget to subscribe to our newsletter to receive the latest news and deals on upcoming Thanksgiving & Black Friday. Welcome, October! As soon as September rolls around, Fall has the best of summer, with a little bit of spring, and winter tossed in. We know it is the time of the year again when we are on the edge of all end year activities. Let's explore very new and fascinating New Apps and Themes in Sep 2018 on phpFox Store now. 1. Autumn Leaves by Foxer There is a saying – Winter is an etching, spring a watercolor, summer an oil painting, and autumn a mosaic of them all. phpFoxer releases new free app called Autumn Leaves. Just a bit more of autumn mood for your users. Learn More →2. Movies System - Light Version by cespiritual This app will allow your members to add movies to your network and be informed of the new upcoming releases in their countries in a daily basis. They can also review the movies and add them to their favorite or watch list. The Light version is free and has some limitation compared to the Full version with trial purpose. See the Full Version here.Learn More →3. Color Feed by Codemake Software This app gives possibilities to put a background on a phpFox post with different colors or picture as on a Facebook. Your post will be more meaningful and surely catch more attention. Learn More →4. Material Landing by Fox Expert Unique Landing Page for the popular phpFox Material template. The app makes your social network well designed and increase registration count. Landing page based on the newest web design trends such as moving background, skew lines… Several back-end settings allow you to manage all components on the Landing page. Learn More →That's all for now. If you want to learn more about the functions and features of these new products, you can contact directly to our third-party vendors for inquiries.Or you can let us know your thoughts on these products by writing to hello@phpfox.com Also, in case you want to customize these apps to your own needs, you can ask our Experts to assist you on your tasks. Summer is almost over, and August welcomes us as the month to round up our summer and go back to work after a long holiday.Last month, you might be busy with outdoor activities, but our developers were still working diligently to deliver new and incredible products to you. Let's find out and enjoy these new apps and Themes in July 2018! 1. Original Photo Link by Scheinwelt-Media This simple app will add a link to the original uploaded photo to the photos action menu. Learn More →2. Video Thumbnail by Scheinwelt-Media Video Thumbnail app changes the video player in the feed to a thumbnail with a link to the videos page. You can use this app to show ads on the individual video pages. Learn More →3. Video Viewer Popup by YounetCo Video Viewer Popup brings your phpFox site great experience on watching videos with a unique popup of the video upon clicking on it.This app is extremely useful when a user wants to do multitasking on site, or just want to see multiple videos at a time without the need of reloading the video detail pages all over again. Learn More →4. Home Blocks by FoxExpert Home Blocks app provides 8 new blocks for members home page or for any other page. It's very useful when sorting filters for different blocks. Users can set up numbers of entries for each block and default sorting tab. Also, the app offers several interesting features included geo searching for the contents near you. Learn More →5. Guest's Feed by Foxer Guest's Login app is a great way to replace your default landing page with activity feed.The app creates a page that looks the same as home page with posting limitation for your existing users and shows it for guests. In this way, guests will be able to preview the latest activity of your network. Learn More →6. JMJTime Coming Soon Template by suresh choudhary JMJTime Coming Soon is a responsive, modern and clean template which indicates your phpFox site status as Under construction/Coming soon. This minimal template is being packed with a countdown timer, contact form, social icons, services and About page where you can write about yourself and your services. Learn More →7. PhotoWorld Template by YounetCo Photo World template lets users showcase their talents and creativities to the world through a beautiful photo gallery.Built with photographs and designers in mind, the template opts to simple, yet completed and sophisticated design with elegant and eye-catching effects, colors & layout. It's just simply what you need to keep your visitors engaged and eager for more when it comes to photos. Learn More → That's it for July!If you want to learn more about functions and features of these new products, you can contact directly to our third-party vendors for inquiries.Also, in case you want to customize these apps to your own needs, you can ask our Experts to assist you on your tasks. Have fun getting back to work and let's rock your social network with these new and astounding products! June puts a significant remark to remind us that we are already half-way through 2018. Now that the summer is here upon us, let's go out, enjoy the sunshine and feel the heat.And in the month of June, our third-party developers were also busy with their works which are reflecting by several new apps and templates released in phpFox Store.Let's discover them now. 1.Protected Photos by Scheinwelt-MediaWith Protected Photos app, users can set protection to their uploaded photos. Users can add a lock on these photos and only allowed users can view these protected photos. There is also a link in user menu for managing and deleting users access. Learn More → 2. GDPR Compliant Banner by FoxerAs we all know that European Union's General Data Protection Regulation (GDPR) came into effect on May 25, 2018. And as a great tool to help your site to be more reliable upon the new rule, this app adds a banner to the footer of your website to indicate that your website is GDPR compliant. Learn More → 3. Meetings by Scheinwelt-MediaThis powerful app is a generic listing system for meetings and meet-ups. Users can add meetings with several different options. Viewers can also contact organizers easily by using the Contact button on each listing item. Admin is able to enable members and gender options for users to use the app. Learn More → 4. Photo Viewer Popup by YounetCoPhoto Viewer Popup app offers you a much more pleasant way to view and manage photos. By just clicking on a photo, a popup will show up with all the essential tools which go along with the photo. You can view the photo and have all the actions on the photo in one place, yet you don't need to load the whole page just for that. Quick and easy. Learn More → 5. Advanced Admin by FoxExpertThis app enhances and expands several admin functions and features to the core Admin section such as Login with any user, Mass message, Mass grand point, Manage statuses and also a new Stats widget with statistical info which you can easily manage. It surely gives admins more control to your site settings with extremely useful additional tools. Learn More → 6. Stories by FoxerStory is a feature which many phpFox network owners requested, and this app finally fulfills this long-awaited appeals. Now users on your site can set a photo or a video right from his computer or mobile device to be their story. These stories will be available for all your friends so they can have an update on your status, but it doesn't clog their news feed as these stories will disappear after a while. The app truly levels up user experience with a status update. Learn More → 7. Dating Template by YouNetCoDating template serves the purpose of connecting users on your site to assist them to make new friends and start relationships. Using modern designs and subtle animation effects, the primary section of the template is a filter which filters and matches users' preferences to their best match. Other than that, the template has all the features and the options you might expect in a dating template. Learn More → 8. SociFoxer Template by suresh choudharySociFoxer is a high-quality social networking theme with unique style and clean code. This template is the best suited for any social website with an impressive main menu, unique home page, and landing page. Learn More → 9. LinkedIn Clone Template by Codemake SoftwareLinkedIn Clone Template is a clean, responsive theme that’s versatile and easy to use. Suitable for both corporate and creative businesses, this clone of LinkedIn design gives you maximum flexibility, smooth, simple transitions give the theme finesse while maintaining a professional look. Learn More → In case you want to know more about these new products, you can contact directly to our third-party vendors for inquiries.Or you can let us know your thoughts on these products by writing to hello@phpfox.com Seems like you need something else? You can ask our Experts to customize one for you.Or you can join our Developer Program to publish your app. We believe that these new apps and themes already filled your thirst on the summer days.Have a good July with fun and happiness! As your site grows, expanding its features is one way to make sure your members to stay connected. That is why our phpFox Experts are continuously creating and providing top of the line 3rd party add-ons. 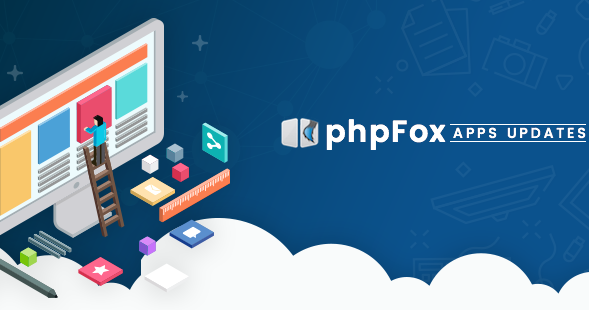 Whether it's an app, new theme, or a different language, all you need to do is to know what your site needs and pick from more than 300 add-ons available in the phpFox store. In the meantime, let's all discover the latest apps and themes that have been added to the store for the month of April.1.Quiz Winner by Suresh ChoudharyDESCRIPTIONQuiz Winner app offers an admin for select multiple winners of any quiz and winners will be shown in front of the particular quiz.Learn More →2. Marketplace Verification by Scheinwelt-MediaDESCRIPTIONThis app was developed for a site that needs marketplace verification for users without changing the user group.Learn More →3. DivFoxer Landing Page by Suresh ChoudharyDESCRIPTIONDivFoxer Template - Landing Page [V4] is an add-on to DivFoxer Template [V4]. Installing this app together with DivFoxer Template [V4] will add a beautiful Landing Page with its rich features and functionalities.Learn More →4. Web Push Notification [V4] by YouNetCoDESCRIPTIONWeb Push Notifications allow users to receive messages instantly from your website even when users are away from it. Using the power of Google Firebase, this app can help you increase engagement of your network by notifying them about their interactions, friend requests and more on their desktop. You can also create your own message and send it to targeted receivers or scheduled to achieve max engagement.Learn More →5. Group Relation by Scheinwelt-MediaDESCRIPTIONWith this app, users can send requests to add each other to relationship groups. They have a page to manage, accept and decline relationships. The relation groups will show up in two different blocks of the user's profile.Learn More →6. New Members Block by cespiritualDESCRIPTIONThis app will add to your network a block to show new members. It filters members by gender, and you can enable a setting to show only members with an avatar. It also shows a tag with the join date.Learn More →You can also check the Community Roundup last month in case you missed it.Can't find what you're looking for? Ask the 3rd party Experts to customize one for you.If you want to develop 3rd party plugins for phpFox and interested to become one of our 3rd party developers, please check out our Developer Program page. One of the reasons why phpFox is the best social network solution is because of its extended plugins. These extended plugins include apps, themes, and language packs which are an absolutely great addition to your social network sites. As of today, we have 300+ plugins available in the phpFox store. But for now, let us give you a quick update on the new apps and themes in March 2018.1. Advanced Comment [v4] by YouNetCoDESCRIPTIONAdvanced Comment app expands several additional features to Core Comment of phpFox and helps your social network own the most modern tools for users to express themselves. The app provides several ways for users to portray their opinions and ideas through images, stickers, and emojis. Various improvements are also implemented to comment section such as picture preview on links, hide/unhide comments, preview on the embedded link... And certainly, all these components & settings are easily customized.Learn More →2. Add Links Button by FoxExpertDESCRIPTIONThe main thing in each social network based on Phpfox it is user's content and it is really important to force your users to add or Share content. Sometimes users registered and cannot find add buttons, but our Add links Button app solver this problem and adds Button into header near notification buttons, so your users never miss add links for any of your apps.Learn More →3. Neo Material [Theme] by Scheinwelt-MediaDESCRIPTIONA clean dark material based theme with a fixed header.FEATURESfixed header when scrolling Modern dark color designLearn More →It is always great to ask the 3rd Party Experts about the overall functionalities about these products. All of the plugins listed in the sore have its own 3rd party developers. These developers provide support for their own set of plugins. If in any case, you won't be able to contact them, just drop us a ticket in your client area and we are happy to help. Helpful Links phpFox Store - https://store.phpfox.com/Apps - https://store.phpfox.com/appsThemes - https://store.phpfox.com/themesPackages - https://store.phpfox.com/bulkLanguage Packs - https://store.phpfox.com/languageThe Experts - https://store.phpfox.com/techie/browse If you want to develop 3rd party plugins for phpFox and interested to become one of our 3rd party developers, please check out our Developer Program page. It is time for us to give you the latest apps and themes in February. Our developers have added new products to the store that you can absolutely install on your phpFox websites. These 3rd party plugins have just been uploaded last month, February. You can use these easy to set up add-ons to enhance your sites and make it more stunning.1. Advanced Search by FoxExpertDESCRIPTION It is really important to allow your users to search anything with great design and autoComplete options(Live Search).Our app solves this problem and makes Phpfox global search looks solid and professionally. Rich information about each item, fresh responsive design, history of searching and Ajax search will make this app must have for each Phpfox website.Learn More →2. Analytics Advanced by Scheinwelt-MediaDESCRIPTION The app adds Google Analytics to your site and shows some charts in your AdminCP. Google Analytics is a web analytics service offered by Google that tracks and reports website traffic.Learn More →3. Default Avatar by FoxerDESCRIPTION This simple plugin will allow you to set default profile picture for all users who didn't update their avatar yet.phpFox has great feature – it can display user's initials with some color if a user hasn't set up his profile picture. However this doesn't work in all cases – sometimes admins want to set a pretty profile picture that will be assigned to all members who don't have profile pictures set up.Learn More →4. Triada Landing page by FoxExpertDESCRIPTION An app which allows having unique landing page and slideshow on Triada template. Must install if you buy our theme - Triada.Learn More →5. Usermenu Advanced by Scheinwelt-MediaDESCRIPTION With this app, you can add additional entries to the user menu.Learn More →6. Fancy Profile Block by FoxerDESCRIPTION We have created Fancy Profile Block for website owners who want to add something new and very personal for their users. Fancy Profile Block's AdminCP allows to configure block's style – colors, background images, add filters to fit any phpFox design.Learn More →7. DFoxer by Suresh ChoudharyDESCRIPTION DFoxer is a Social Network theme that is ideal for connecting professionals and companies.DFoxer is all you need to create a site for any social, company, tourist base, camping, and so on With Page, Event, Marketplace and Blog features.Learn More →8. Triada by FoxExpertDESCRIPTION Trending design with a sliding main menu and a unique homepage with best widgets for any social networks, which show user activities. Ultra responsive (mobile first) design which works great on any device. Expand features from the Material theme, it means you'll have all new features from 4.6 + fresh design with many admin settings.Learn More →What did you think about the new apps? Does anyone catch your attention? How about the new theme?We hope that this list has helped you narrow your search down. When looking at these apps and theme, don’t forget to try out their demo and explore the features. Don't forget to check out apps and themes in January 2018 in case you missed it.Have any questions about these apps and themes? Please contact the vendors directly via your client area account. Or submit a ticket if you need support from your site. You can also chat with our live chat agent on our website.